Multilingual friendly stone WordPress theme that is adjustable with qTranslate X, WPML, Polylang and attached with other plugins. Fully responsive and it is tested by various browsers, various type of resolutions and also tested by cross-platform devices. This theme is completely SEO friendly and it is built up with SEO Standards code and this theme is friendlier with SEO plugins. SMO compatible including social media icons and a number of social sharing options plugins. Font based icons are connected to give a plenty offers to their content showcase through fonts and link to social media icons. Default slider is connected, through this slider, anyone can easily change the slider and it is also attached with video slider also. The header of the inner page is totally dynamic and it is able to hold an iframe, font, banner, image etc. You can choose a layout option which is given in the sidebar layouts form for blog posts and pages. The sidebar is completely widget compatible and this can perfect for several types of widgets and according to choice user may add other widgets which will be viewed in the sidebar. Generally, widgets are connected in header and footer and this theme is widgets compatible. This theme is included with POT file and ready for translation. All sections are connected to the homepage. Color changes are possible through color picker and every element of the template is connected with the color pickers. Text and image changing option, page builder, shortcodes and layouts, menu and navigation with header and footer layouts are possible according to your choice. Very easy setup and plugin and documentation friendly. Shortcodes compatible with more than hundred shortcodes packed are available in this template for a simple fancy content adding. This theme is also page builders friendly that signifies anyone can use the customizable page builder option except the site origin to build up their website. Being an RTL friendly theme, a different type of RTL languages and other languages supported like Hebrew and Arabic. Manual guide and step by step documentation are provided which is very handy for new users to build up the whole website. If you have a granite business and for which you are planning to create a website for your business growth then you can definitely prefer a free stone granite WordPress theme for those people who would desire to decorate their kitchen and their interior and exterior design of the house, office, restaurant by granite stones. So, a free WordPress theme is more appreciable for granite manufacturers, retailers and remodelers and who are connected with quartz, marble and with the engineered stone related business. You can use a large number of attractive template for your website. Kitchen designer, home designer, home architecture, interior and exterior designer can publish their designs through the latest artistic granite designs theme weblog also for a large number of viewers. If you want to desire to design your website through a wide range of essential and innovative template design then you can select a free granite WordPress theme for spreading your granite business. You also need to update your existing website related to granite pattern and design through a unique and appreciative free theme. A marvelous interior design can change your sweet home and your most preferable kitchen environment totally. A top-notch free stone granite WordPress theme layout provides a high-quality design and image to fulfill your web-design requirement with the proper layout theme that also helps you to have a best-designed kitchen and home. It is also very helpful for all viewers who are really interested to decorate their kitchen and house to provide an elegant look. The free granite WordPress theme is completely responsive for spreading your granite business and you can showcase your website with a very sophisticated and professional manner through this theme. This theme is always picture perfect and through your website visit, a wide range of customer will want to contact you for their home and kitchen interior and exterior design. A free WordPress theme always gives a unique and very essential homepage and the homepage is furnished with a various type of granite patterns related with granite tiles, slabs, kitchen counterparts, mudrooms and vanities of the bathroom. A granite business always depends upon showcasing and presentation. When you select a free stone granite WordPress theme for your website you also get a slider section that is included with this theme and that offers you to showcase your business platform with the best class granite pattern and designs which is completely enriched by the beautiful images to attract your visitors. The stylish and smartest theme is also included with an area of feature section to present your granite remodeling, manufacturing, piercing and polishing services with an absolutely perfect heading and most suitable description to execute your exact services to your valuable clients. Just showcase your modern, innovative and very latest collection of granite design in the gallery. The theme is included with an inbuilt template page of the gallery and you do not have to face any type of complication for insertion of the image. You just need to place the images inside that template and you will get an absolutely stunning page and your potential clients will be surprised to see your lucrative webpage design. Through this elegant design, your website will get a fabulous look and it is fulfilled by the complete dynamic view with more flexibility that increases your business with more opportunity. 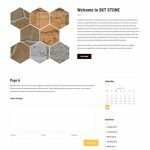 This free stone granite WordPress theme is very simple and easy to manage and this theme is totally perfect for first-time users/novice users. This theme has no difficulties to customize. The inner pages of this free theme built up with a very pleasant header banner area and that area is more comfortable for all inner page headers. Multilingual plugins section has also attached to this theme.